The Spokane Home and Yard Show set up has started! This event is being held at the Spokane Fair and Expo Center from Thursday February 22nd through February 25th. We are going to be featuring more hot tubs this year than what we have ever taken down there before! There will be 14 hot tubs from Caldera Spa, Hot Spring Spa, FreeFlow spa and a special feature from Caldera’s European hot tub line, Utopia Provence. There’s a Caldera Utopia Provence hot tub that is the perfect hot tub. 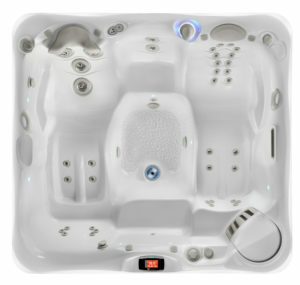 It seats 4 adults comfortably and features 43 customizable jets to create the perfect hydrotherapy experience. While soaking in 265 gallons of swirling relaxing water you can enjoy the SpaGlo Multi-zone LED lighting system. This happens to be the only hot tub within the Caldera’s Collection to include duel facing loungers with a smaller profile. It’s a high performance luxurious hot tub designed to fit on most every patio or deck. All of our store locations will remain open with the same great savings!